Context: Suryanamaskar is a yogic practice widely practiced across India. Along with the available studies on physiology, there is a need to study its psychological effects. Aims: This research aims at studying the effects of suryanamaskar on relaxation dispositions (R-dispositions) among college students with high stress in Pune, India. Settings and Design: The present study was conducted in a college setting and used a randomized control group design. Materials and Methods: A group of 419 college students (age 17-22 years) were assessed on stress symptoms using the ABC relaxation theory. A total of 124 out of 419 students who were identified as high on stress were randomly assigned to an experimental and control group. And 40 participants each in both the group completed the program and were assessed on R-dispositions and stress dispositions before and after the suryanamaskar program. Statistical Analysis Used: Analysis of covariance (ANCOVA) was used to study the differences in R-dispositions and stress dispositions between the experimental and control groups. Results: The experimental group was found to be higher on the R-dispositions of physical relaxation, mental quiet, at ease/peace, rested and refreshed, strength and awareness and joy and lower on sleepiness, and stress dispositions−somatic stress, worry, and negative emotion compared with the control group. Conclusions: It was concluded that suryanamaskar is effective in leading to R-Dispositions like physical relaxation, mental quiet, at ease/peace, rested and refreshed, strength and awareness and joy and reduces sleepiness, somatic stress, worry and negative emotion at a dispositional level. Keywords: College students, relaxation, suryanamaskar, yoga. Suryanamaskar is one such form of yogic practice. Saraswati (1983) defines it as a series of 12 physical postures. Suryanamaskar includes various asanas like−Pranamasan, hasta utthanasan, padahastasan, ashwasanchalanasan, ashtanaga namasakar, bhujangasan, and parvatasan. Datye  states that suryanamaskar is an upasana (worship) and vyayam (exercise) which are practiced in 10 counts. After reviewing all the definitions they can be combined to define suryanamaskar as a series of yogasanas (physical postures), along with breathing and mantrocchar (recitations). Out of the many existing types, the present research uses the version that has 10 poses (10 counts). Suryanamaskar as a traditional practice or a form of yogic exercise is well-known, but there are very few evidence based studies on the effects of suryanamaskar on physiological changes , and none that document suryanamaskar and its psychological effects. The present research used theory of ABC relaxation  to study the effects of suryanamaskar on relaxation-Dispositions (R-dispositions) and stress dispositions. ABC relaxation theory defines relaxation, or centering, as the act of sustaining passive simple focus (sustaining attention, while minimizing overt behavior and covert c ognition). Its three phases are: (a) Withdrawal, (b) recovery from fatigue, effort and tension as well as release from the constraints and burdens of adult, analytic, verbal thinking and ordinary everyday expectations; and (c) opening up to the world, renewed, and refreshed. These phases are manifested in specific conscious experiences, relaxation/centering-related states of mind, termed relaxation-states (R-states). The primary states include: Sleepiness, disengagement, physical relaxation, rested/refreshed, at ease/peace, energized, joyful, mental quiet, mystery, positive detachment (manifest like childlike innocence), awe and wonder, thankfulness and love, prayerfulness, and timeless/boundless/infinite/at one. The one metastate is aware. Apart from R-states, the theory also defines many other variables related to relaxation. The variables used under this study are stress symptoms, R-dispositions, and stress dispositions. Stress symptoms are those physical, mental, and emotional symptoms of stress that people generally report. R-disposition is the enduring propensity to report R-states over time. Dispositions are long-lasting traits, in contrast to shorter lasting states. Stress disposition is the enduring propensity to report stress-states over time. Researchers have pointed out specific R-states evoked through various activities , but not suryanamaskar. Studies have used ABC relaxation theory to explore the process of relaxation across various relaxation strategies. Correlation studies like correlations between stress and relaxation,  relationship between health status, stress, R-dispositions, motivations and beliefs;  studies on various interventions and techniques  Breathing exercises, and relaxation;  Yoga, meditation, and ABC relaxation theory;  ABC relaxation training as a treatment for depression  have been documented. In the present study, we aim to document the effects of suryanamaskar on R-dispositions among college students with high stress. It is hypothesized that suryanamaskar group will be higher on R-dispositions and lower on stress dispositions compared with the control group. The main aim of the present research was to study the effects of suryanamaskar on R-dispositions and stress dispositions among college students with high stress. This was a single-center randomized control study. The sample of this study included 80 students (44 boys and 36 girls) who completed the program out of 419 (229 boys and 190 girls) students who were screened on Smith Stress Symptoms Inventory (SSSI) from a college in Pune, India. The study was approved by the authorities and the Principal of the college where the study was conducted. A total of 295 participants did not meet the criteria of being high on stress symptoms on a self-report inventory. College students with high stress were included in the study if they met the following criteria: (i) Students falling above the 75 th percentile on minimum of four out of six subscales of SSSI. (ii) Students without any severe physical illness. (iii) Students between the age 17 - 22 (iv) Students who are not practicing any other exercise/sports activity. [Figure 1] indicates the trial profile. Pretest was conducted on 124 participants out of which 80 participants contributed data to the postest on R-dispositions and stress dispositions. The reasons of dropouts were attributed to participation in other programs/activities in college, lack of interest, and constraints on travelling to the venue of the suryanamaskar program. The initial screening was conducted at many places within the college through the standardised self-report inventory on stress symptoms during the college time. Posttest assessment was done at the sports facility where the suryanamaskar program was conducted for the suryanamaskar group and on the college campus for the control group. Subjects consenting to participate in the study were randomly allocated to either the suryanamaskar group or the waitlist for the control group. Randomization was performed using random numbers generated by random number table. Subjects were randomly assigned to the Suryanamaskar group and the control group. 62 Subjects were randomly assigned to Suryanamaskar and the control group each out of which 40 participants of the experimental (16 boys and 24 girls) and control (28 boys and 12 girls) group completed the programme. These students were between the ages17 to 22 and from the Arts and Science faculty. The nationality of the students was Indian and majority of them were Marathi speaking. The control group was kept on a waitlist and Suryanamaskar programme was conducted later even for the control group. The present study used the Following self report inventories. The SSSI  measures frequently reported stress symptoms. It was based on the Stress Costs Inventory (Smith (1992) and the Smith Stress Symptoms Scale (Smith, 1990) and taps 6 symptom categories developed through factor analysis: Worry/Negative Emotion (which can be scored as separate a priori worry and negative emotional subscales), striated muscular tension, autonomic arousal/anxiety, depression, interpersonal conflict/anger. Thirty-five items ask one to indicate how one feels "right now" (state version) or "typically" (disposition version) on a four-point Likert scale. The present research used the disposition version. The Alpha reliabilities range from 0.89 to.76. The SRDI  tests one's propensity to be relaxed over a period of 2-weeks. It taps 14 R-States: Sleepiness, disengagement, physical relaxation, rested/refreshed, at ease/peace, energized, joyful, mental quiet, mystery, positive detachment (manifest like childlike innocence), awe and wonder, thankfulness and love, prayerfulness, and timeless/boundless/infinite/at one. This inventory consists of 30 Items on how one feels "over the period of last 2 weeks" on a four-point Likert scale. Alpha reliabilities range from 0.75 to 0.65. The above stated inventory also provides three subscales of dispositions, that is, the propensity of experiencing stressed states over a period of 2 weeks. These subscales of Stress include somatic stress, worry, and negative emotion. Alpha reliabilities range from 0.70 to 0.65. This study was conducted in a college setting. A total of 419 college students from a college in Pune, India were approached in groups. Appropriate permissions from the college authorities were obtained before approaching the student and teacher coordinators. Rapport was established with the members of the group and they were requested to respond to a set of two psychological tests (SSSI and SRDI) along with their demographic details. Standard instructions were given to the respondents and were also informed about the confidentiality and anonymity of their responses. They were told to respond honestly and were told that these assessments had no relation with their academic performance. After the screening procedure, those eligible for the study were randomly assigned to the suryanamaskar and the control group. The suryanamaskar activity was conducted in the college campus in the sports facility near an open ground and the students were guided by a team of experts. Suryanamaskar trainers were experienced in teaching suryanamaskar for five years or more and were qualified for suryanamaskar training. The participants gave appropriate consent and were observed for medical conditions and contraindications. The attendance record for all the participants was maintained and the reasons of the participants who discontinued also were recorded. A pretest and a posttest using SRDI (including relaxation and stress subscales) were given on the 1 st and 14 th days to both the groups. The entire test administration was done in English. The intervention group received a suryanamaskar session for 14 days. The everyday suryanamaskar session included warm up, 13 rounds of suryanamaskar with mantras and breathing and cooling down (sitting position) which took approximately 20 min. As there were many ways of performing suryanamaskar, a standard method (10 counts) of performing and a standard set of instructions was established and followed throughout the sessions. Participants were encouraged to maintain incidental recordings in a diary kept at the sports facility where suryanamaskar sessions were conducted. The practice of suryanamaskar was monitored by expert instructors on a daily basis. The control group did not receive suryanamaskar or any sort of exercise. It was made sure through the data sheet that they did not engage themselves in any other relaxation activity. No activity was chosen for the control arm as the study did not aim at testing differences in R-dispositions between suryanamaskar and any other exercise. The data were collected and was analyzed using SPSS (version 17). Descriptive statistics ANCOVA was used considering the pretest as the covariates. 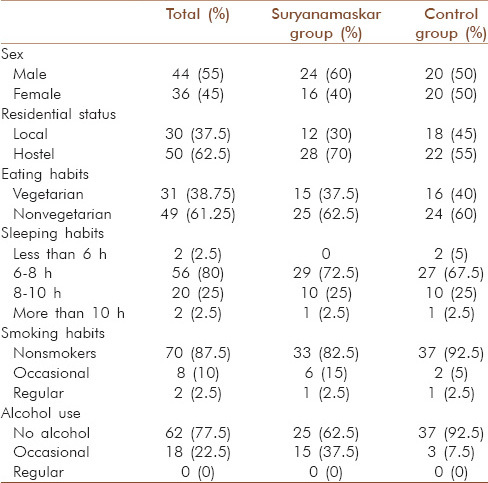 [Table 1] indicates the demographic details of the participants in the study like residential status, eating habits, sleeping habits, alcohol use, and smoking. [Table 2] shows the results means and SDs for the suryanamaskar and the control group. The means are adjusted using ANCOVA using the respective pretest scores for the R-dispositions as the covariate. These findings clearly show that the posttest scores were significantly lower for sleepiness (F = 38.30, P < 0.01, mean difference = −1.85, P < 0.01). The posttest score was not significantly different on the disposition−Disengagement. The experimental group was significantly higher for the dispositions−Physical relaxation (F = 7.09, P < 0.01, mean difference =0.78, P < 0.05) mental quiet (F = 26.93, P < 0.01, mean difference =1.64, P < 0.05), at ease/peace (F = 25.05, P < 0.01, mean difference =1.72, P < 0.05), rested and refreshed (F = 92.17, P < 0.01, mean difference =1.35, P < 0.05), strength and awareness (F = 9.11, P < 0.01, mean difference =0.95, P < 0.05), and joy (F = 13.16, P < 0.01, mean difference =0.99, P < 0.05). Other R-dispositions like love and thankfulness, prayerfulness, childlike innocence, awe and wonder, mystery, timeless/boundless were not found to be significantly different across the suryanamaskar and the control group. 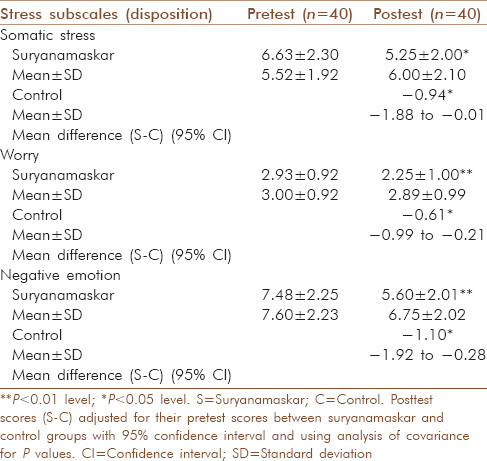 The participants of experimental group were also lower than the control group on the Stress dispositions−somatic stress (F = 4.04, P < 0.05, mean difference = −0.94, P < 0.05), worry (F = 9.63, P < 0.01, mean difference = −0.61, P < 0.05), and negative emotion (F = 7.15, P < 0.01, mean difference = −1.10, P < 0.05). Appendix 1 and 2 give the details of results of ANOVA (Univariate test) and pre-treatment equivalence. The aim of the present research was to study the effects of suryanamaskar on R-dispositions among college students with high stress. Participants eligible for the study, that is, high on stress symptoms were randomly assigned to suryanamaskar and control group. Differences on various R-dispositions and stress dispositions were studied. As the [Table 2] and [Table 3] indicate there is a significant difference in 7 out of 14 R-dispositions and all three stress dispositions. The mean differences for the subscales indicate that sleepiness and stress reduced as a disposition and there was an increase in physical relaxation, mental quietness, ease and peace, being refreshed, strength and awareness, and joy. The components of suryanamaskar include breathing, regulated movements, and mantras. The observed effects on the above stated R-dispositions can be attributed to components of suryanamaskar. According to the ABC relaxation theory, the above-stated relaxation states are explained as relief from cognitive aspects of stress like conflict and frustration and quieting of externally engaged cognitive activity. Through this one ceases to think about, analyze, plan, or attempt to change the external world and a diminution of self-directed and self-reflective effort like mental quiet, which is necessary to feel relaxed. It is clear that a 2 weeks program helps participants to reach the state of a quiet mind at a dispositional level. These results are similar to that of the previous studies on ABC relaxation theory, yoga and meditation,  and deep breathing. , Suryanamaskar is an active pursuit toward relaxation. Previous studies also indicate that active interpersonal pursuits of relaxation are associated to strength and awareness and joy. The present suryanamaskar program did not demand participants to engage in solo or isolated practice of suryanamaskar. Rather, this was an activity conducted at sports facility on the college campus. The positive effect on strength and awareness and joy can be attributed to the nature of the activity in the present research where more than one person (up to five persons at a time) performed suryanamaskar. Prayerfulness, love, and thankfulness were two R-dispositions that were not found to be significantly different in the suryanamaskar and the control group. Previous research  indicates that these relaxation states are prevalent in those who prefer relaxing through prayer, meditating, and chanting. Although suryanamaskar has a component of prayer, it was not successful in evoking prayerfulness as a R-disposition. Role of other variables like practice, belief might be playing a role in the R-dispositions−prayerfulness, love, and thankfulness. On the subscales of stress dispositions, the results can be discussed in the light of a study which states that yoga stretching is associated to strength and awareness therefore suggesting its appropriateness for negative emotion, progressive muscle relaxation, and autogenic training with physical relaxation therefore their appropriateness for somatic stress and meditation with mental quiet suggesting its value for worry. The effects of suryanamaskar are seen to be multidimensional in the present research on physical relaxation and mental levels. Thus, suryanamaskar is seen to be effective for all three subscales of stress dispositions. This research is a step towards adding to the data of previous studies on suryanamaskar and its physiological effects. , This is a first study to document effects of suryanamaskar on the psychological states. Thus, the hypothesis stating that suryanamaskar group will be higher on R-dispositions and lower on the stress dispositions compared to the control group was accepted. Activities being conducted for college students for stress reduction, positive physical, and mental health is not a new phenomenon. Many studies ,, have shown its positive effects on the physiological and psychological variables. A very similar age group has been researched for studying the effects of abbreviated progressive muscle relaxation in a high stress college sample whose results also indicate positive effect on mental and physical relaxation. The present study is an addition to the research body indicating that suryanamaskar, a yogic exercise is an activity that has a positive effect on R-dispositions and stress reduction at a dispositional level. Our study has a few limitations like the control group was not subjected to a placebo treatment. The variables tested were only at a dispositional level and do not guarantee effects that might last for longer. Further studies on extended duration, specific psychological illnesses can provide therapeutic value to the practice of suryanamaskar. It was concluded that suryanamaskar is effective in leading to R-dispositions like mental quiet, at ease/peace, rested and refreshed, strength and awareness and joy. suryanamaskar group was lower compared with the control group on the stress dispositions−somatic stress, worry, and negative emotion. This study would not have been possible without the support of the Principal of Fergusson College, Dr. R. G. Pardeshi; Head of the Department of Psychology, Dr. S. C. Abhyankar. The authors thank Dr. Avinash Godbole for guidance in suryanamaskar. The authors also thank Varun Venkit, Swatchhanda Kher, Rajeshwari Baxi, Kaustubh Tambhale, and Rohan Valvekar for their immense support for conducting the suryanamaskar program and data collection. Ji H, Zhang L. Research on college students' stresses and coping strategies. Asian Soc Sci 2011;7:30-4. Smith JC, Sohnle S. Stress, relaxation dispositions and recalled relaxation states for one's preferred relaxation activity. In Smith J, editor. Advances in ABC Relaxation - Application and Inventories. New York: Springer Publication; 2001. p. 143-4. Wei B, Kilpatrick M, Naquin M, Cole D. Psychological perceptions to walking, water aerobics and yoga in college students. Am J Health Stud 2006. Weinstock J. A review of exercise as intervention for sedentary hazardous drinking college students: Rationale and issues. J Am Coll Health 2010;58:539-44. Malathi A, Damodaran A. Stress due to exams in medical students-role of yoga. Indian J Physiol Pharmacol 1999;43:218-24. Gopinathan P. Combined effects of yoga and relaxation training on selected psychological variables among tennis players. Academic Sports Scholar 2013;2. Granath J, Ingvarasson S, Thiele U, Lundberg U. 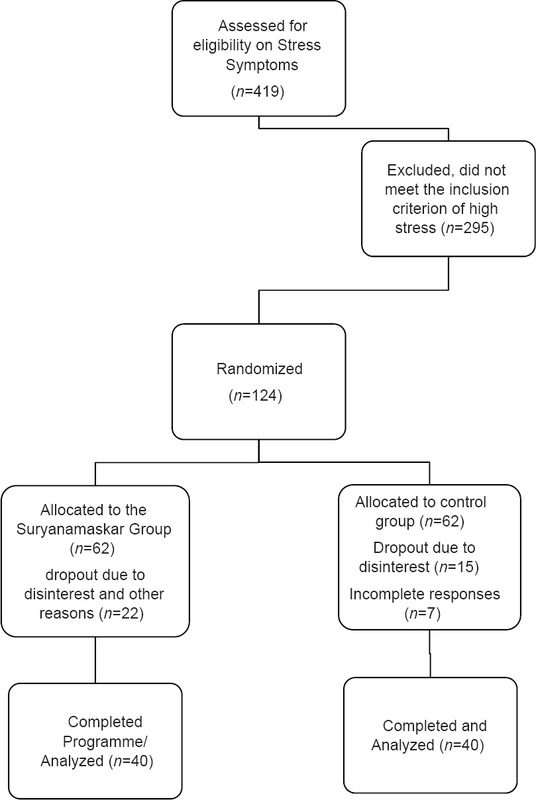 Stress Management: A randomized study of cognitive behavioral therapy and yoga. Cogn Behav Ther 2006;35:3-10. Jensen PS, Stevens PJ, Kenny DT. Respiratory patterns in students enrolled in schools for disruptive behaviour before, during and after yoga nidra relaxation. J Child Fam Stud 2012;21:667-81. Kumar K. Psychological changes as related to Yoga Nidra. Int J Psychol 2006;6:129-36. Saraswati SS. Suryanamaskar - A technique of solar vitalization. Munger: Yoga Publications Trust; 1983. Datye HV. Suryanamaskar: Upasana aani Vyayam. Pune: Bharatiya Vichar Sadhana; 1990. Bhavanani AB, Udupa K, Madanmohan M. A comparative study of slow and fast suryanamaskar on physiological function. International journal of yoga 2011:4:71. Sinha B, Ray US, Pathak A, Selvamurthy W. Energy cost and cardio respiratory changes during the practice of Surya Namasakr. Indian J Physiol Pharmacol 2002;48:184-90. Smith J. Advances in ABC Relaxation - Applications and Inventories. New York: Springer; 2001. Gaff J. Health status, stress and relaxation dispositions, motivations and beliefs. In: Smith J, editor. Advances in ABC Relaxation - Application and Inventories. New York: Springer Publication; 2001. p. 145-8. Ritchie TD, Holmes RC, Dan A. Preferred relaxation activities and recalled relaxation states. In: Smith J, editor. Advances in ABC Relaxation - Application and Inventories. New York: Springer Publication; 2001. p. 187-92. Smith J, Jackson L. Breathing exercises and relaxation states. In: Smith J, editor. Advances in ABC Relaxation - Application and Inventories. New York: Springer Publication; 2001. p. 202-204. Smith JC. ABC Relaxation theory and yoga, motivation, and prayer: Relaxation dispositions, beliefs and practice variables. In: Smith J, editor. Advances in ABC Relaxation - Application and Inventories. New York: Springer Publication; 2001. p. 197-201. Gonzales R. ABC relaxation training as a treatment for depression for puerto rican elderly. In: Smith J, editor. Advances in ABC Relaxation - Application and Inventories. New York: Springer Publication; 2001. p. 209-11. Rice S, Cucci III L, Williams J. Practice variables as predictors of stress and relaxation dispositions for yoga and meditation. In: Smith J, editor. Advances in ABC Relaxation - Application and Inventories. New York: Springer Publication; 2001. p. 193-6. Wang YT, Taylor L, Pearl M, Chang LS. Effects of Tai Chi exercise on physical and mental health of college students. Am J Chin Med 2004;32:453-9. Buckworth J, Nigg C, Physical activity, exercise and sedentary behavior in college students. J Am Coll Health 2004;53:28-34. Dolbeir CL, Rush TE. Efficacy of abbreviated progressive muscle relaxation in a high stress college sample. Int J Stress Manag 2012;19:48-68.